Darren Miller's stoppage-time penalty salvaged some Hampden homecoming joy for Queen's Park against Clyde. The set-up and de-rigging required for Glasgow's Commonwealth Games had exiled the hosts to Airdrie for 14 months. 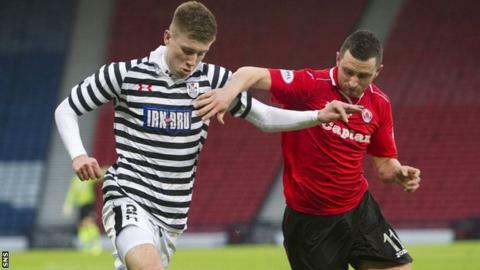 Clyde's Iain Gray met Ged Traynor's corner to make it seem it would not be a happy return for the Spiders. But referee Kevin Graham spotted a foul on Willie Muir in a busy penalty box and Miller scored to delight a boosted home support. With reduced admission prices and a special extended welcome to the Mount Florida locals, Queen's Park's Hampden return was always expected to draw a larger crowd than usual. "Anything up to 52,000 - beyond that it'll have to be standing room only," was the sarcastic reply of the club's media officer when asked pre-match to estimate the likely attendance. It transpired that this New Year encounter attracted just over 2,000 - a figure approximately four-times that of a normal Queen's Park home gate. The Spiders' players were eager to replace supporters' memories of their last match at the national stadium - a disappointing defeat by Peterhead in November 2013 - and Ciaran McElroy's dipping half-volley almost helped them on their way to doing that, but landed on the roof of Clyde goalkeeper Alan Martin's net. Gus McPherson's Queen's Park came even closer a few minutes later, with Paul Woods' close-range strike disallowed for offside before former Leeds United keeper Martin touched the right winger's curling shot onto the far post. Clyde offered very little in the first half but shocked the hosts by taking the lead after the break. Centre-back Gray popped up at the back post to poke in Traynor's corner, making Queen's Park pay for their first-half profligacy. Referee Graham infuriated the home team by not awarding a penalty when McElroy appeared to be tripped, and Spiders' supporters ire would have increased further had their goalkeeper Muir not saved brilliantly from Clyde's Brian McQueen. And Muir also ended up drawing the foul that did get the Spiders a spot-kick, with Traynor pulling back the goalkeeper who had gone up for a corner at the death. Miller stroked the ball in at the right corner to give the expectant crowd a result more to their liking. Scott Durie (Clyde) is shown the yellow card. Ged Traynor (Clyde) is shown the yellow card. Goal! Queen's Park 1, Clyde 1. Darren Miller (Queen's Park) converts the penalty with a right footed shot to the bottom right corner. Penalty Queen's Park. draws a foul in the penalty area. Penalty conceded by Ged Traynor (Clyde) after a foul in the penalty area. Corner, Queen's Park. Conceded by Hugh Murray. Kevin Watt (Clyde) is shown the yellow card. Corner, Queen's Park. Conceded by Scott McManus. Attempt blocked. Scott McManus (Clyde) right footed shot from more than 35 yards is blocked. Corner, Queen's Park. Conceded by Iain Gray. Iain Gray (Clyde) is shown the yellow card. Substitution, Clyde. Kevin Watt replaces Steven McDougall. Substitution, Queen's Park. Sean Burns replaces Patrick Slattery. Attempt saved. Patrick Slattery (Queen's Park) right footed shot from outside the box is saved in the top centre of the goal. Substitution, Clyde. Michael Daly replaces Brian McQueen. Attempt missed. Kevin Fotheringham (Queen's Park) left footed shot from the centre of the box is close, but misses the top right corner. Ged Traynor (Clyde) wins a free kick in the attacking half. Attempt missed. Scott McManus (Clyde) right footed shot from outside the box misses to the left. Substitution, Clyde. Stephen O'Donnell replaces David Sinclair. Attempt missed. Shaun Rooney (Queen's Park) header from the centre of the box is close, but misses to the right following a corner. Corner, Queen's Park. Conceded by Steven McDougall. Corner, Queen's Park. Conceded by Ged Traynor. Corner, Queen's Park. Conceded by Scott Durie. Attempt saved. Brian McQueen (Clyde) right footed shot from the centre of the box is saved in the bottom right corner. Substitution, Queen's Park. Kevin Fotheringham replaces Ciaran McElroy.